discuss the possibilities! Call the parish office ext. 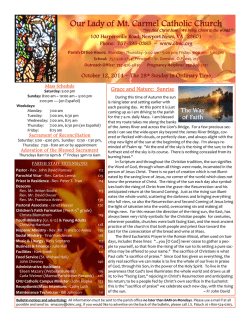 120 or jhassan@olmc.org for more information. process and taking your place at the Lord’s Table. 595-0385 ext. 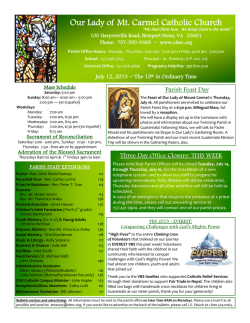 120 or jhassan@olmc.org. and fellowship-following the Mass. This is a wonderful opportunity to meet our SPRED friends, their families and catechists, and to personally extend your welcome. God is shared through symbolic catechesis. older) that meet on Wednesday evenings. more, contact Christa at 595-0385, x119 or Miki at 596-7162.
with their time, treasure and talent! Interested in being a part of the BREATHE team next year? Call Christa at 595-0583 ext. 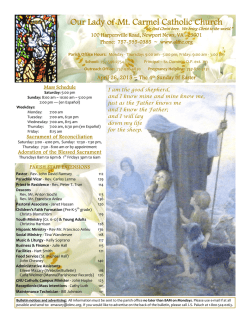 119.
the 10AM Mass, every Sunday. KidCheck Account required. Kingdom Kids Worship is available at the 10:00am Mass. Children process out at Mass & return before the Eucharist. 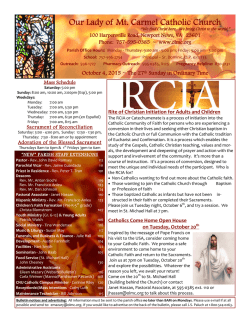 go.kidcheck.com or go to olmc.org. Gathered By Grace will gather on Sunday, May 31, at 11am. the mission of the Church by working for peace and justice. love to the kids who will attend. 595-0385 ext. 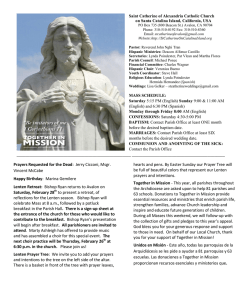 119 or register online at olmc.org. News of the Gospel. May God bless you abundantly! our End of the Year Party! an introduction to modesty and how we should present ourselves to others. grow deeper in your faith. Space is limited, so act fast! 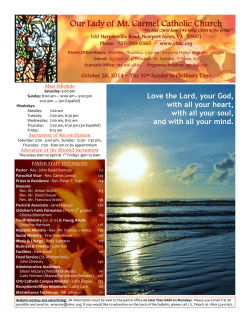 Contact Christina at charrison@olmc.org for more information. 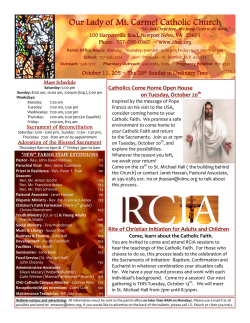 available online and at the Christina Formation Bulletin Board. accompany our youth on this trip. 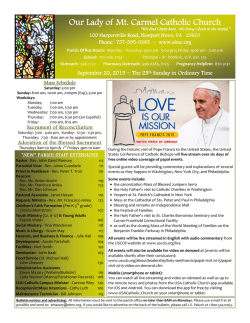 For more information, contact Christina at charrison@olmc.org or at x128. been holding these children in prayer. check in at the Daily Mass Chapel. 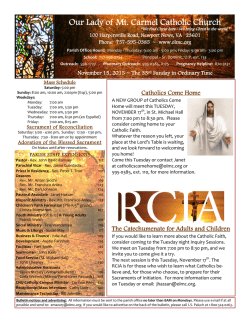 Christina at charrison@olmc.org if you have any questions. be our guest speaker. Topic TBD. ext. 118. I will let you know what time are available. We need you to help save lives! life of families on our society. We will not be taking our own bus, but you can join the Diocese in their scheduled transportation and visit. at 7:00pm in the Gathering Room at OLMC. The service project is for Pregnancy Outreach. St. Martha’s Guild will meet at the home of Kathy Nowinsky, 109 Haviland Dr., NN, on Tuesday, May 19, at 7:00 p.m.
Every is asked to bring a salad to share. RSVP to Kathy (596-4376) by May 17th. clothes. We served 32 women and 39 children. Special thanks for all the Garden donations!! You generosity is a huge blessing!! errands, or in some other way have a time of refreshment. one and keeps him or her safe at no cost to the family. Parish Trip to Lancaster, PA is SOLD OUT! park at St. Michael Hall facing Harpersville Road. plan the refreshments: Call or email Helen at soulsisters@olmc.org or 898-7851.
registration form can be found at www.olmcschool.com under Development tab/Golf Tournament. at 596-2754 for more information or to purchase tickets.  A part-time middle school math teacher for the upcoming 2015-2016 school year. Teacher certification is required. 8am until 6pm. Adorers are especially needed from 3pm 4pm, as well as other hours. A SIGN-UP sheet will be available outside the door to the Worship Center, for newcomers who would to commit an hour a week to adoration. concepts learned in math, science and health as they work on the garden. donating food to the OLMC parish food bank as part of our outreach ministry. Applewhite Garden Club, and all who have been involved in creating such a fun learning experience! Ejemplo de "María Santísima Madre de DIOS"
contacta a las personas indicadas. que son activas en la comunidad parroquial. Para mas información, llamar al Diacono Francisco. DOMINGO 10 DE MAYO, 2:00PM. DOMINGO 17 DE MAYO, 2:00PM. Quieres ayudar con la Liturgia de la Palabra para Niños. Ponte en contacto con el Diacono Francisco, para recibir información de como integrarte al grupo de catequistas para niños.  Primer Domingo de Mes: Reunidos por la Gracia.  Tercer Domingo de Mes: Presentación de niños a la Comunidad, Convivio, bendición de cumpleaños. DESPUÉS DE LAS 9:00 AM EN ADELANTE. DE 7:00 AM A 6:00 PM. TIEMPO DE ADORACIÓN Y CONTEMPLACIÓN. Buying or Selling Real Estate? Call us! (labor only) and we do the work.